Paper Picking Processes: Are They Picking Your Pocket? For all the talk about warehouse technologies, more than 60 percent of DC’s still use paper picking systems, according to a 2015 survey by Peerless Research Group. Admittedly, about half of those paper users also supplement their processes with select scan verification technologies or automation systems, and most of them are also running a Warehouse Management System (WMS). But, really, considering that 60-70 percent of warehouse labor costs come from the order-fulfillment process, why on earth would a DC operation stick with such an old-school, labor-intensive pick method? Typically, it begins at the beginning. 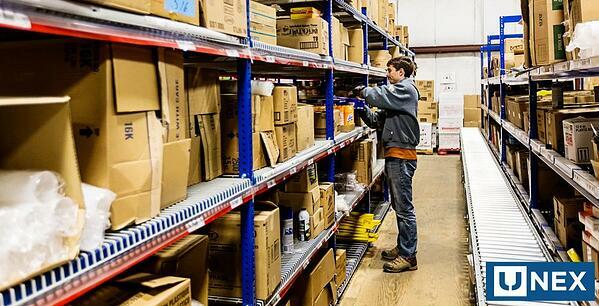 Most business’s fulfillment operations start out small, with a fairly limited SKU base and a small staff of pickers. At this early stage, paper-based picking of single orders makes sense because it’s simple. And as pickers gain experience and grow more familiar with product characteristics and SKU placement, their pick rates improve, making paper-based picking appear to be a productive, sustainable solution. Over time, though, as the business grows, orders increase, SKUs proliferate, the warehouse footprint expands, pick paths grow longer, and workers are added or replaced, the situation reverses: travel time increases, labor costs mount, and productivity drops. E-commerce exacerbates all of these trends. At this increasingly complex stage, each paper pick ticket is simply sending the picker into a repetitive chain of redundant processes to pick a single order. Often, an experienced picker will pick up several pick tickets at once, in a sincere effort to boost pick rates by picking multiple orders on a single trip. At a glance, that seems like batch picking, but that’s just an illusion – it’s actually multiple-order picking, which sounds like the same thing but isn’t. In fact, randomly grouping several pick tickets into a single pick trip can actually increase travel time because the slowest order holds up the entire group. Because the picker must pick all the items on each ticket during a single pass, he is forced to transport all the picks along his entire pick path. Basically, individual – and potentially unrelated – orders become inseparable from the group, bound to travel together start to finish. That’s no more – and often less – efficient than single-order picking. "Actual" batch picking (as opposed to the grouped paper picking described in the previous paragraph) groups orders into a logical pick set, which is based on factors the orders have in common, such as SKU location or order size. Batch picking – with the aid of inventory optimization software and systems – decreases touch requirements, shortens the pick path, reduces travel time, improves pick accuracy, and optimizes labor efficiency. The bottom line is that improving your pick operation improves your bottom line. Whether you are running a traditional paper picking system or a customized combination of computer-directed methods, adding appropriate products and technologies to your picking processes can improve inventory visibility and accessibility, boost pick speed and accuracy, and eliminate the glitches and holdups that shortchange operational productivity and rob you of profitability. If you need help picking and choosing the best solution, an experienced UNEX Pickologist can help you explore which options best suited to your inventory and industry. For example, to recover lost time and effort, one of customers recently utilized our recently updated SKUBE slotting analysis service, which allowed them to optimize their pick paths and store SKUs in their ideal locations. This resulted in increased productivity in their order picking operation while they continue to transition over to new picking processes and technologies. UNEX boasts a full line of innovative order-picking solutions, including Roller Racks, Span-Track, and Flow Cell systems, all designed to optimize and speed picking operations. UNEX helps pickers quickly and easily find and retrieve items- even when using paper picking methods. Contact your UNEX Pickologist today to explore our wide variety of order-picking solutions.